A little homework assignment for you, an experiment to help you discover the power of this Practice to change life. It is something to try even if you are new to this Practice, or if you have a lot of miles down the Zen road. It is also a litmus test, a demonstration of the ability of this Practice to work great change in your life right now. Oh, this little act won't fix all the problems in your life, and won't even change a flat tire. You still will have to grab a jack and get to work. But it can completely change how we experience and react to all circumstances, including detours and crashes and obstacles on life's bumpy road. Can you find the switch within ... even if you need to "fake it until make it" a bit ... to turn your resistance into acceptance, your desires into satisfaction, your disturbance into peace? When you find that switch, the problems in life will be just the same as always ... yet as different as different can be. Your assignment is to flip that switch to change one's whole attitude in that moment. Flip it back and forth, moving between disappointment and contentment, upset and peace, anger and joy ... on and off, switching back and forth a few times in emotions and attitude, good to bad to good and back again ... (even if you must simply pretend that you are better at doing so than you now are. Perhaps some real feeling will emerge just from the play acting). As I said, problems in your life and in this world will remain. Some may just vanish when the heart drops resistance (many a problem ain't no problem if we merely come to feel "no problem"). For other problems however ... from the small things in life to the biggest issues and injustices that this world faces ... there will still be a lot of work to do, and many things to fix, but our non-resistant attitude will help us to do what needs to be done. It is a lesson I have learned in my life many times, and in countless problems, whereby changing the heart is as easy as changing an old tire. Last edited by Jundo; 09-22-2017 at 03:55 AM. Good words. Start road trip today and will work to smile at the tire if needed. Hah! Try sleeping on that same couch again ! Works good when hurricanes cancel trips to meet Meishin in Austin! I really needed to hear that today. Thank you! I live in the last house at the end of a cul-de-sac. There is a common grass area between me and the house across the street. The grass is township property but I cut it. I got home yesterday and there is a sign stuck in the grass: "Please stop cutting the grass at this height. You're killing the grass and helping the weeds! Thank you." My first reaction was; What nerve! If he doesn't like how I cut the grass, he should cut it himself! It's not my grass anyway!" By the time I got in the house I thought; Oh, get over yourself already. What do I know about grass anyway? His grass is nicer than mine. He taught me something so just appreciate it. My wife asked me what I was going to do about all this. I said I'm going to adjust the height of my lawn mower. He taught me something. No need for aggression here. She said "Look at you acting all positive." First of all thank you very much for the teaching. How lovely to see your daughter, and see you in the role of a dad! I will certainly try your challenge, but let me share my fresh experience. As I told when I came back to the forums, I'd been through some time in which I didn't sit regularly. I was angry all the time, arguing here and there. Now It's been more than 20 days that I sit at least once, everyday. Sometimes (most times?) I'm sleepy. Sometimes I keep chasing thoughts. But I can certainly assure that zazen has brought me balance outside of the zafu. I'm arguing much less or nothing, I wake up feeling grateful and happy with what I have. And when things go wrong, I get angry, yes, but do not start arguing with everyone or thrashing all around. It will be hard to acknowledge every moment that I'm upset, because I usually notice it late, but I think it will be a nice exercise for ango and to keep it going afterwards. Had the chance to practice this three times already in the few hours since watching ❤️ Hi Chao Chao!! Q: What do you call it if you get a flat tire, fix it, and then after using it for ten more years -- it goes flat again? Thank you Jundo. Today there were people using large powered saws to cut slabs of granite for a construction project next door. Clouds of dust and the high rpm blades against rock made it difficult to focus on work. They start up again at 8 am... I will accept the situation....NOT.. . Actually I’ll be working at the library tomorrow, however I will practice as you challenge with whatever resistence comes up while at the library. Thank you very much, Jundo, for this excellent talk. I learn a lot from that. Then press the button. Finding that switch, before it gets buried under tons of heavy thoughts is what helps keeping me away from panic attacks. Shikantaza does help with both, finding the switch and the need for switching. Far from always, but even if not, there is some of the 'ultimateness' removed. Will do, Jundo! This is one of my favorite of your lessons. It really does work. Please say hello to Chao Chao from me! Well, I remember myself complaining I can't see the switch. I still can't, but I can operate it. The switch is in the switching, if this makes any sense. I like this teaching of yours very much (also the setting with the garden view). And it helped me a lot yesterday when I was in a situation with a turmoil of painful thoughts and feelings. I could not escape the situation, so I did our homework. Is this practice aligned with the nurturing seeds practice? Are they compatible, mutually beneficial practices? I yam what I yam, that's all that I yam. Will try this, thank you Jundo. Yes, I believe they are all variations on the same traditional Buddhist themes. Thank you very much for your teaching Jundo. Enligtenment has a switch. But in the dark we often lose it even though it's right here inside. Worth remembering. ~ Please remember that I am very fallible. Although keeping an eye on our inner self and reaching for that switch is very good practice, two things come to mind that seem at odds with this method of dealing with reality. How can we tell the difference between a healthy change of heart and denial of issues that should be recognised and maybe even dealt with? Reaching for the switch instead of saying sorry to someone, thinking oh well, impermanence you know.....switch. An unhealthy and messy home inviroment for kids where we should roll up the sleeves and get cleaning up but everytime we notice and feel bad......switch. These examples are a bit lame but you see my point. Also embrasing and fully live/ sit through something, looking the tiger in the eye and learn from it, also seems a part of our practice.Seeing and accepting reality for what it really is. Cant switch everytime in life if we want to grow and learn. How to avoid that the good practice of the change of heart switch becomes a eyes closed/brain off switch? I hope I formulated my question clearly enough? Its a subtle distinction. My button was pressed by my step son who still lives at home. Came in from work, had had a stressy complex day to find house a mess, washing up not done, step son still in bed ( he's 22) .....napping. Have to confess I could feel that anger switch flipped. Was just about to let my pin drop out and yell at him when I thought no! ....the switch!.....I paused, and thought hang on. Why has he not got up, maybe its more complicated, maybe he's not well.....maybe he is lazy?.....but do I want to go to war over dirty dishes and hoovering?????...... my relationship with my step son is already complicated. I used the switch..... decided I would discuss this with him later, when I was not angry. Anger is never a useful emotion......switched.......thought am I being too soft, maybe he deserves some kind of yelling at? Maybe Im a rubbish parent??? ?.......switch again...breath. .....breath. We still have to change the flat tires, not bypass them or pretend that they do not exist. One cannot just pretend that a peaceful, accepting attitude will make the problem go away. Some problems may evaporate if we simply relax our heart (e.g., if I am obsessed with the possibility of being hit on the head with a meteor beyond all sense given the unlikelihood of that happening, then relaxing the heart makes the problem disappear. Of course, there may be underlying psychological issues in my personality that make me worry about unlikely things, and perhaps I need to look at those issues and not ignore them. However, the immediate problem itself evaporates. There is no such meteor). If I am obsessed with a possible cancer, I may wish to relax the heart ... yet still quit smoking and watch my diet. If I am upset with serious injustices in society, global warming, or simply my son't not doing his homework ... I may wish to relax the heart, yet keep on working hard to resolve the problem. It is just common sense, I feel, to figure out which problems or other situations we can ignore and which we need to face. I sometimes say that Zen Practice allows us to experience life on two levels at once. For example, I sometimes speak of "acceptance without acceptance." One part of us radically accepts a situation, but simultaneously another part does not and continues working for change. It is as if we see the world one way out of the left eye (accepting) and other way out of the right eye (not accepting), and both eyes open at once provide the clarity of Buddha Eye. We can experience both emotions at once, as one, each perfuming the other. I have a friend who is a medical worker in a very stressful and frustrating environment where he is helping many people, but it is often very disappointing and aggravating. He could easily burn out. Yet the combination of "acceptance without acceptance" lets him keep on doing what needs to be done to fight the good fight, while on the other channel, just going with the flow ... all at once. Last edited by Jundo; 09-24-2017 at 10:47 AM. So without revealing information that does not belong on a forum that is more or less public, here's one way this talk by Jundo helped me. A person close to me did something incredibly stupid and insensitive. It hurt a lot. Feelings of sadness then rage followed. But I thought of what Jundo had said. And without much ado I separated what was done from my reaction. The action on their part was their action. But my reaction was my reaction. Two things. Clearly I had to act in response, and I did. I let it be known that the action had been painful and infuriating, and I said what I would do as a consequence. It wasn't a dramatic and relationship-ending consequence. But it was meaningful. And the message was received; apologies were offered and accepted. And my feelings changed in a very short time from being chaotic and painful to an amazing calm. Something happened, I tended to it, and then let it go. Life went on and there was no leftover pouting. That's all. Thank you, Jundo, and everyone in this conversation. Although I try to not analyze what I get out of this practice, if pressed I'd offer something close to what you presented here. It isn't about "going with the flow" or "accepting that's the way things are". More like "this is the universe universe-ing and it isn't about me at all". Once I realize that it isn't all about me then I realize that it is just the universe universe-ing I find I am better able to handle the situation with equanimity. The thing for me sometimes is, I'm in a bad situation with others and I flip that switch and the others want to stay angry and upset. I've actually had people get angry at me for not being angry. I don't want to get all preachy with them. So just let them go? Talk them down? I would say to just let them be, let them be "angry at you for not being angry." Talk if it will help. (Be warned that I just watched the new Star Trek, so may be confusing my own advice with what a Vulcan might do in the face of Klingons). Thank you. People mistake me for a Klingon all the time. I can't speak for our teacher but I can tell you about my on going experience with the recent earthquake in Mexico. There have been a lot of different reactions from people. They range from the super angry and defensive to the resigned and nihilist. In all cases suffering is just too much to bear especially for those who lost their home or loved ones. And then there are the ones that cried (and still cry), that are in pain, those who lost everything... but wiped the tears and put on the hard helmet to begin working on helping survivors and help others. To accept life as it is, it's a great challenge. But there's is peace and calmness when you do what you need to do and learn from all situations in life. thank you for this lesson, Jundo. im getting better each day. It is clear I did not make my point. The amazing abilities we humans have in the face of overwhelming odds or facing disasters and adversity are clear. I speak of something else. Never mind. Thank you Kyonin, my thoughts are with you and all who are making an inspiring effort after the disaster. Sometimes even a single man picking up a shovel to start cleaning up, can set and entire nation back to work. Thank you, I think this is very important. Something I was told a while ago that might be useful: If there are reoccurring thoughts that cause a lot of stress/anxiety/anger, think these thoughts as vividly as possible instead of letting them come up randomly. Really bring these feelings to the surface. Then sit with these feelings, not adding any mental commentary, not trying to reduce their intensity. Just sit with them. Sit with full acceptance, sit without the goal of overcoming these feelings or 'working through' them. Just sit with no expectations, no place to go outside of this moment. Sitting this way, we see that the feeling isn't solid or stable. It is made of innumerable tiny, transient, vibratory sensations that are passing away in every moment. We don't try to see it this way. We just watch it. We see it for what it is. I wouldn't recommend this as a very regular practice. 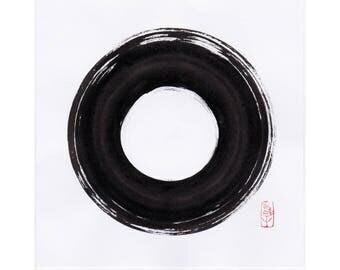 Zazen, without intention, sitting with what is irrespective of what bothers or preoccupies us, is enough. Nothing needs to be added or taken away. Even so, this little addition might be useful for facing certain things that bother us. Just looking at something, gently but without flinching or averting pur gaze, can be enough to break it apart. As long as it shows us that everything that arises is just what is, in this moment. Psychologist respectfully weighing in. The strategy you suggest is used in psychotherapy at times, but must be employed with care. In panic episodes, for instance, some respond positively to what amounts to implosion therapy. But for many others making symptoms vivid may exacerbate the problem. I would not offer this as a one-size-fits-all suggestion because it does not. I appreciate your intention of helping others. Unfortunately I missed your reply all those months ago. I just happened to see your post today. Thank you for your response. I was, of course, speaking from personal experience when I recommended this method. I really had no idea about any potential risks associated with it. The potential to exacerbate symptoms definitely makes sense. Also, I'm looking into starting an Msc in Psychology soon. I'm particularly interested in the psychotherapeutic applications of Buddhist and Stoic techniques and concepts. I'd be very happy to discuss these ideas further, if you are interested. Thanks for making people aware. This teaching is a jewel. It help me to reflect where I’m standing and how are the days when I miss some sitting.